I have this uncontrollable giddiness about the special theme for this week! This is week is my annual (yup three years running!) Ghoulish Grub Week! This is probably one of my favorite series of blog posts all year long! 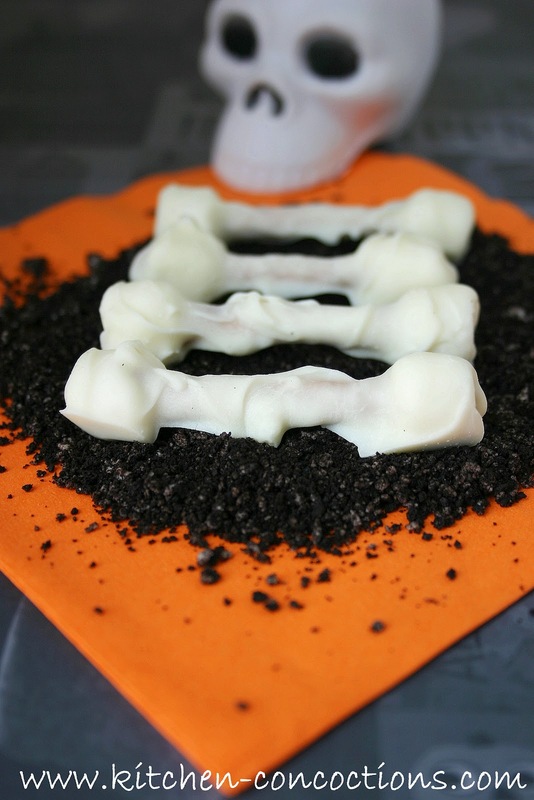 A week devoted to fun, and yes sometimes a little gross, Halloween inspired food and treats. Eric and I have many traditions but some of our favorites take place in the month of October. Picking out pumpkins and carving them, our annual scary movie marathon (we watch one scary movie every night until Halloween, going strong at 7 for 7), eating comforting soups and chilies, and making Halloween themed treats. Since we got an early cold snap this year, this weekend was perfect…. Cloudy and chilly in the 50’s (that’s chilly folks, remember I am in Texas! ), we have been even more giddy about our fall traditions. 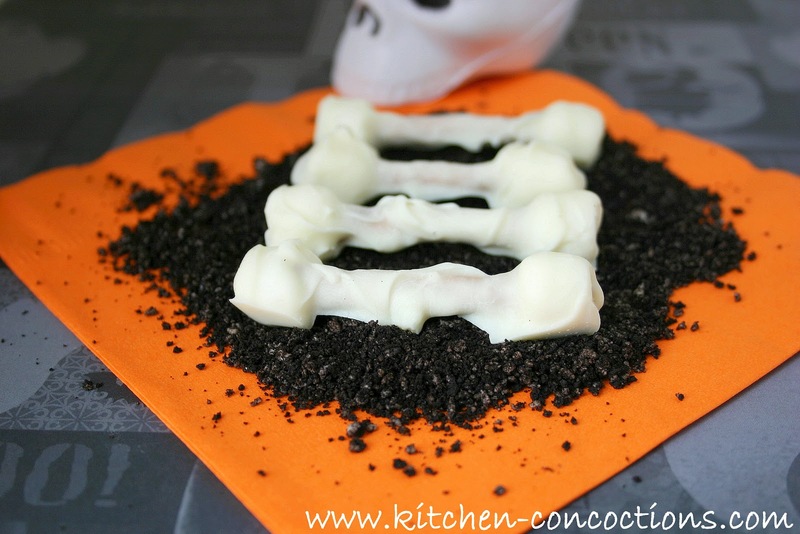 The first Halloween treat that I dare share with you are Edible Chicken Bone Treats (that’s what Eric thought they looked like)! These are uber easy and use common ingredients that I am sure are lying around your pantry. 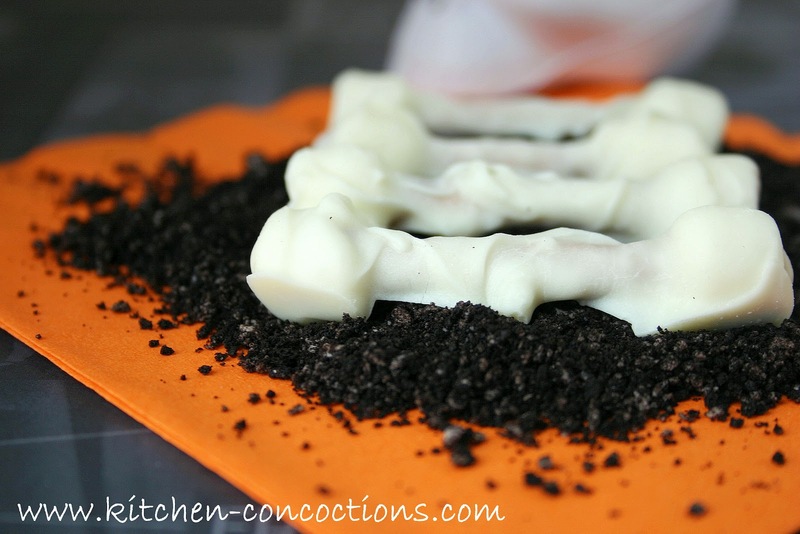 They could easily be whipped up ahead of time, say in preparation for a Halloween bash, and are a great activity to get the kiddos involved. The perfect activity and snack for a family night in, watching scary movies, like Casper or Monster House! What are your favorite scary movies (for kids or adults)? Place chocolate bark/candy melts in a microwave safe bowl. Microwave for 30 seconds. Remove bowl from microwave, stir and return to microwave, microwaving for an additional 30 seconds or until the chocolate is melted; being careful not to burn (use directions on candy melt packaging as a guide). Stir melted chocolate again making sure chocolate is completely smooth and melted. Once chocolate is ready, dip both ends of pretzel stick into melted chocolate. Insert one miniature marshmallow onto the end of each pretzel being careful not to push all the way through to expose the tip of the pretzel. Dip entire pretzel stick, including marshmallow ends, into melted chocolate and cover completely. Use a fork if necessary to remove chocolate covered pretzel gently shaking off any excess chocolate. Place chocolate covered pretzel on wax paper, allowing to harden for 15-20 minutes. Repeat as needed with remaining ingredients. Enjoy with a scary movie! How fun! And I'm so excited to see what else you have up your sleve!